From time to time, I like to feature fresh writing voices to keep things interesting. I haven't featured an anime review on this blog for quite some time, so when Chris Smith, DJ and guest relations manager for 91.8 The Fan, a 24-hour online radio station by and for fans of the Japanese animation industry, offered to write a review of Hunter X Hunter, whose 2011 reboot recently (and temporarily) concluded, I said go for it! The result is below. Enjoy! Sometimes watching anime is hard. Do you decide to watch a new, up-and-coming show or should you watch a classic? Do you watch something you've been meaning to finish or do you start something anew? Back in 2011 I decided to pick start on an adventure of a series that was both old and new at the same time: the remake of Yoshiro Togashi's Hunter X Hunter. I was already a fan of Togashi's previous series, Yu Yu Hakusho so I had high hopes for my viewing experience. Hunter X Hunter is a shonen series that follows the adventures of Gon Freecss on his quest to become a Hunter and find his father. 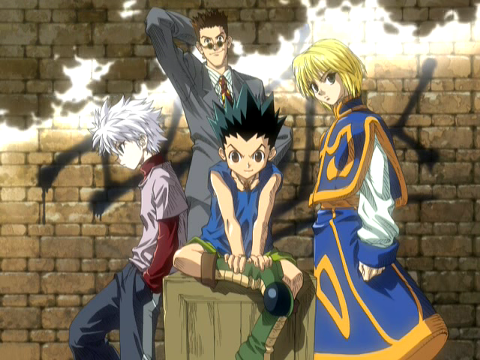 Along the way, he befriends Kurapika, Leorio, and Killua and the series focuses on each of them in turn instead of focusing solely on Gon, which I really enjoy. There are only two recap episodes throughout the entire 148-episode run and it also follows the manga very closely with minimal filler. Hunter X Hunter marks one of the rare few series that intrigued me to the point where I read all of the manga that is currently available in the US. In a world of anime that follows the same tropes over and over again, this series is a breath of fresh air from high school romance or the random sports series. Oddly enough, it manages to accomplish this by just being a standard shonen series. While watching Hunter X Hunter, I had a familiar feeling of coming home from school to watch Dragonball Z and I had a moment where I found myself holding my breath due to how intense the show was. This feeling translated to when I read the manga to see what would happen next, where I got so absorbed into what was going on, I didn't realize that I was near the end of the volume until it finally appeared. Some of the show's greatest hooks are the animation and music, and how they work in combination to draw you in and keep you there. The new 2011 version was animated by Madhouse, the studio responsible for such great shows as Trigun, Death Note and Black Lagoon. The opening theme song never really changes, it just switches between verses of the full song seemingly. Despite that, it never fails to capture that old style sensation of me as a little kid watching a cartoon. I haven't had a chance to see the older version of this anime, but I would highly recommend checking this incarnation out, even though it's only available in Japanese with English subtitles at this time. All 148 episodes are available for viewing on Crunchyroll and a good amount are also available on Netflix. For anyone looking to get into the manga like I did, you can find them digitally on the Viz Media website, which also has an app so you can read them on your phone. While there is still more Hunter X Hunter to be had in the future, the series is currently on hiatus indefinitely due to Yoshihiro Togashi's back problems. There's not a real end to the series in sight, so the animation side of the product has ended itself at a decent stopping point until such a time that there is more to animate. Since the anime series has turned into something of a juggernaut in terms of episode length, it's highly unlikely that an American company will pick it up for a dub, but with Bleach running out of episodes to air on Toonami I am hopeful that someone will undertake the task while we wait for the author to write more of this series that has quickly become one of my favorites. Over the years, I have convinced many of my friends to get involved with this great show and this hiatus is a great time to jump in since you can see the definite ending point, however far off on the horizon it may be. I would be more than happy to experience it again in any facet, whether it be with a new dub, new episodes or just watching it from the beginning with someone who hasn't seen it before. Chris can be found on Twitter at @christmas4477 as well as on Facebook, posting about awesome geeky things.